Made of nylon with crosshatched leather trim. Interior features one zip pocket, two slip pockets, and may hold a 15" laptop. 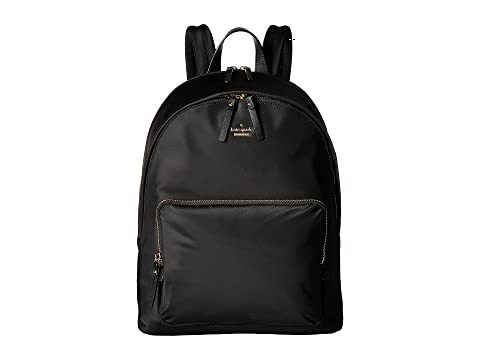 We can't currently find any similar items for the 15 Inch Nylon Tech Backpack by Kate Spade New York. Sorry! Love this! Use for work trips. Enough for my laptop and small purse and very stylish! Many compliments. Overall: Rated: 2 stars! Comfort: Rated:1 stars! Style: Rated:5 stars! I really wanted to love this backpack. It is beautiful, well made, and so stylish. The pockets and size are perfect. BUT - I couldn't shorted the straps enough to be comfortable. I walk to work (10 mins each way) and carry a heavier load. The shortest the straps could go don't allow the weight to properly sit on my back. I felt like I was in middle school with my backpack down so low. It was pulling at my shoulders and causing back pain. Just as a reference - I am 5'8" 130lbs. I had to send it back. I hope Kate Spade makes straps that go shorter. Seems odd considering how tall I am, I don't know how this could be comfortable for shorter or petite women.